This book provides a roadmap for lenders who want to help out other people by lending them money through the Prosper marketplace. By using the conservative investment approach outlined in this book, lenders can better manage the risks associated with lending money to friends they have never met. This book is written for investors and lenders who do not have a background in consumer finance, yet who wish to participate in this new form of interpersonal finance. A premise of the book is that many people will want to engage in passive lending, where they automate the process of finding and bidding on listings. People can also choose to automate the process of finding appropriate listings to review and then bidding on them manually if they wish. To become a lender on Prosper, you first have to register with Prosper, have your bank account verified, and then transfer money to your Prosper account. Its also important to realize that lending money to consumers is risky. As a result, there are a variety of safety precautions to be taken to manage this risk. Standing orders are instructions to Prospers computer for finding and bidding on borrowers listings that meet your search criteria. By using standing orders, you can run a highly-automated virtual business that works whether or not you are signed in to your Prosper account. But standing orders have to be designed correctly or you could be bidding on listings that have a high likelihood of becoming delinquent and then defaulting. Groups are the foundation for Prosper because they represent communities of borrowers and lenders with shared interests. Groups also let group leaders create virtual credit unions of borrowers and lenders in cyberspace. This chapter describes what groups are and how lenders can work effectively with groups and group leaders. Group affiliation can be included in advanced searches and standing orders when searching for appropriate listings to bid on. A set of standing orders can work in concert to implement a lending strategy. This chapter describes the various factors to consider when developing such a system. The chapter concludes with recommendations for when to use various types of standing orders. Delinquencies and defaults are a cost of doing business on Prosper because loans are made to consumers. But delinquencies and defaults are mostly an emotional issue to the lenders because Prosper outsources the collections process to collections agencies. The time to start thinking about how to exit the lending business is before you start lending in the first place. Amortized loans pay interest and principal every month, but you have to wait until the loan is paid in full before you can get all of your principal back. If you need to get out early, you may be out of luck and you need to factor that possibility into your financial planning. People-to-people lending sites can be used for social lending and for managing private loans. There is also a list of URLs for the resources mentioned in this book. Endorsements of "Happy About People-To-People Lending With Prosper.com" by Roger Steciak. "Everything one needs to know to be a competent Prosper lender is in this book. There are other ways to get this information  like the school of hard knocks - but I recommend the book. The author provides a well balanced, third-party review of Prosper, along with plenty of how-to tips to get the new Prosper lender up to speed fast. Before turning your hard-earned cash over to strangers, you will want to read this book." "A must read book for the average lender next door looking for a jump-start on Prosper. This book is down to earth, easy to understand and walks you through the A,B,C's of lending money to strangers on Prosper." "After reading Happy About People-to-People Lending with Prosper.com I found it very educational on how a person can lend money to complete strangers while getting a good return on their investment. I will be using this book as a guide to further expand my investing on Prosper." "Just as eBay evolved as community based on trust and the tenet that "people are basically good," Prosper has transformed our traditional concepts of community building and social networking. The platform supports a web of integrated relationships from which all parties can mutually benefit. This book describes how lenders can work closely with group leaders and their borrowers to form a community that is profitable for the lenders and has a positive impact on the lives of all members of the group." "I had been planning for months to set up automated lending systems on Prosper  the idea is completely enchanting and very exciting! Unfortunately I just couldnt find the time to study the Prosper web site in detail and figure out all the nuances to actually getting my automated lending business up and running. Thankfully, now I dont have to. Happy About People-to-People Lending on Prosper.com: How to Lend Money to Friends You've Never Met is the shortcut Ive been searching for. With it by my side I have little doubt Ill have my lending machines up and running reliably on Prosper in no time at all!" Prosper Marketplace, Inc. (as Prosper.com, or Prosper) opened its doors to the public in February 2006. Prospers mission is to enable everyday people like you and me to lend and borrower money with everyday people like you and me. People-to-people lending has been around for centuries. People who need to borrow money have gotten together with the people in their local circles who have the money to lend. There is peer pressure to lend and borrow wisely and to pay back the loans on time. Prosper brings this same people-to-people lending experience to the modern world with a twist: the rate of interest charged for a loan is determined by an online auction where lenders bid for the privilege of lending money to the borrower. The company has all of the licenses necessary to lend money to consumers and it complies with all Federal and state consumer credit and debt collection laws and regulations. Prospers computers keep track of the lenders who provide the money for each loan and who are to receive the payments made by each borrower. Prosper makes sure the marketplace for lending and borrowing is safe, fair, and easy to use. 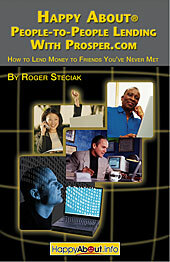 Roger Steciak has been lending on Prosper.com since the summer of 2006. He has a background in engineering, business, and law, with over three decades of experience working in the high technology field and over a decade of experience with investing in non-correlated asset classes to minimize the risks and maximize the returns of his investment portfolio.